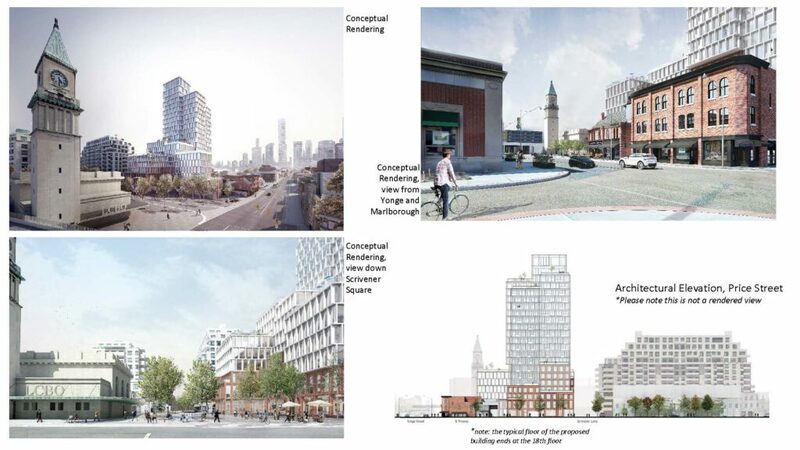 Community Meeting on Revised Scrivener Square Development Proposal | South Rosedale Residents' Assoc | The SRRA is one of Canada’s oldest ratepayer groups. Formally incorporated in 1931, the Association is committed to providing South Rosedale’s residents with a strong voice relative to the area’s unique position as one of Toronto’s most desirable residential communities. City of Toronto Planning will hold a community consultation meeting on Tuesday, March 20 on a revised Scrivener Square/Price Street development proposal. The SRRA encourages you to attend to obtain details on the revisions, ask questions and convey your comments. This follows the City’s November 27, 2017 community meeting where the original proposal, which includes a 26-storey (97.3 metre) residential tower, was presented. The revised proposal calls for a 21-storey (85.4 metre) tower that, consistent with the original proposal, is divided at its peak into 4 equal quadrants, from 18 to 21 storeys in height. The new proposal also reflects a significantly altered overall configuration including public/green space opposite the railway station, a new subway entrance and several other changes. This configuration would depend on the closure and sale of the L-shaped City-owned laneway that runs through the site. This project site has a very lengthy history, and the active involvement of the SRRA and several other community groups in it dates back several decades. Over the past year, as previously communicated to SRRA members, representatives of the SRRA, Summerhill Residents’ Association, ABC Residents’ Association, the two Thornwood buildings, and Toronto Lawn Tennis Club have had several non-binding meetings with the developers. The developer’s revised proposal is reflective of the discussions to date. The dialogue with DiamondCorp continues. The SRRA is working with DiamondCorp to arrange a separate presentation and local community meeting to provide more information to and enable more discussion with South Rosedale residents. While this is has not yet been confirmed, both parties are aiming for a date in the second half of April. Details will be provided when available. SRRA: The SRRA seeks community input on the revised proposal following the March 20 presentation. To share your comments, please email us at development@southrosedale.org. City Planning: Written comments can also be mailed to the Planners at Toronto and East York District, 100 Queen St W Floor 18 E Toronto ON, M5H 2N2. Councillor Wong-Tam: You may also contact Councillor Kristyn Wong-Tam, Ward 27, at Councillor_Wongtam@toronto.ca or (416) 392-7903.